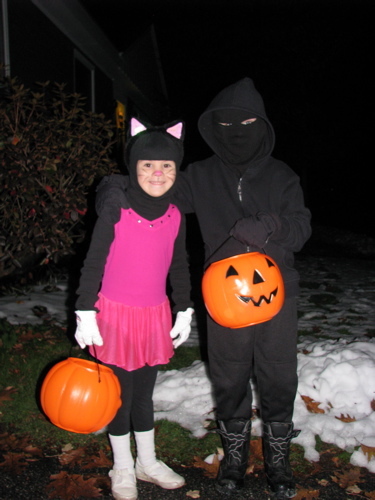 The ballerina kitty and the black ghost ready to trick-or-treat in what’s left of a rather early snowfall. Last year’s ninja masks got reused with a few minor changes. Most everything else came out of their closets or from the Goodwill store. Ballerina kitty was inspired by the cat eared headband and got a black tail sewn on from a length of black feather boa from the craft store. 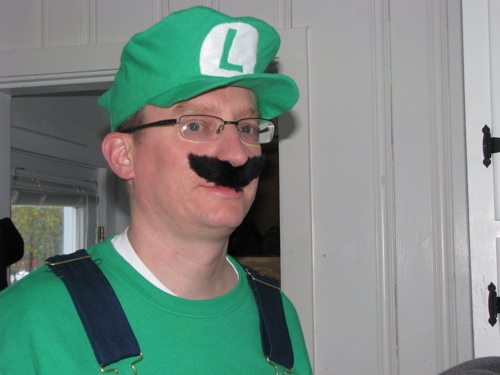 Here’s Rich coming home from work wearing his Luigi costume. One of his co-workers was Mario. I made their hats. Rich’s was made from tee shirt material leftover from turning a short sleeve tee into a long sleeve tee. 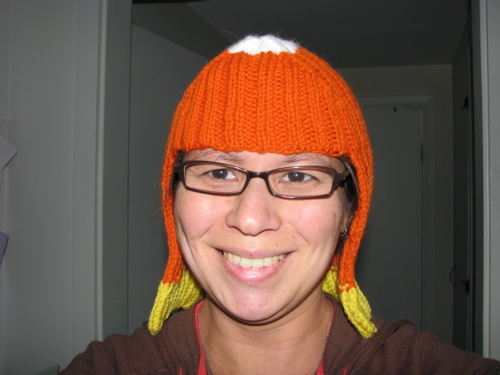 And here’s the candy corn wig I made for answering the door. The pattern is Hallowig by Megan Reardon. 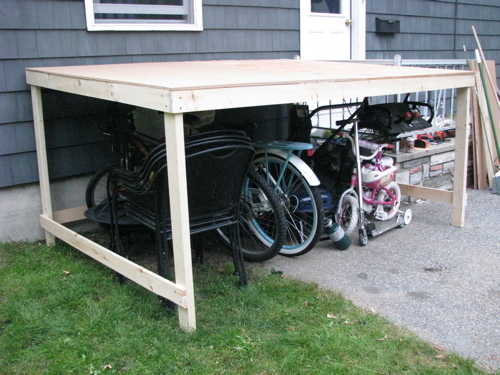 Rich and I built this shelter for the snowblower and the lawnmower, it’s big enough to hold bicycles, chairs and a few other odds and ends. It took us 3 hours and about $75 worth of lumber. It went together quite smoothly and we were pretty pleased with out efforts. We were especially pleased with the top which slants away from the house. This may not be obvious in the picture. It did involve some math and the two of us arrived at slightly different angles, so I split the difference when I set the miter saw; turned out perfect. 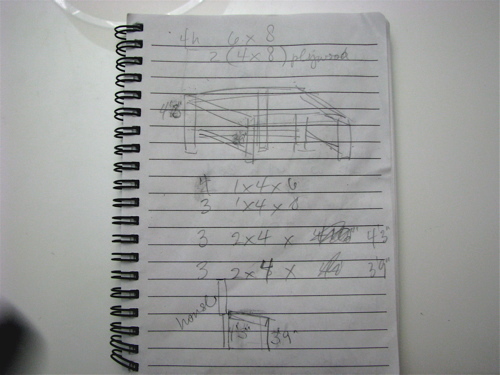 Below is the original sketch. I know it looks horrible but we knew what it meant and it worked. We are still figuring out how we might want to enclose the sides and perhaps add a drop down tarp to the front. And we plan to paint it the same color as the house. After it stops raining! I learned how to make this dish from my friend Stefanie quite a few years ago. It’s one of the few things I cook where I follow the recipe, mostly. The notebook paper is torn, faded and stained but I still get it out when I make this. 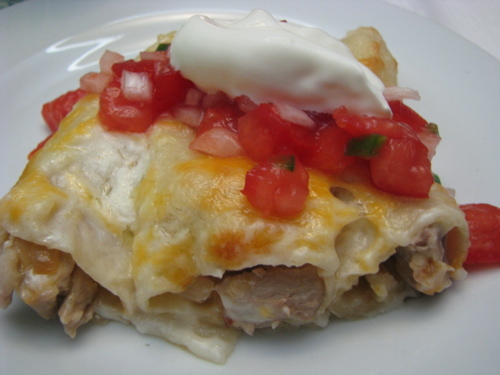 It’s hard to go wrong with sauteed onions, chicken, and shredded cheese baked in a sour cream white sauce but we love it all the more because it reminds us of old times and old friends.